A version of the standard mouse bridge optimized for optical mice. Note: Due to the nature of this product we cannot offer our 30 day customer satisfaction guarantee on this product. No warranty. 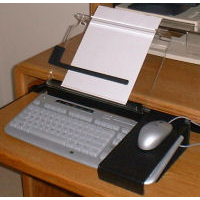 Designed to cover the numeric keypad of a keyboard, the Universal Mouse Bridge can be used with keyboards of varying sizes and shapes by adjusting the position of the detachable bars (attached by hook and loop tape) located underneath the bridge itself. In addition, it has a longer mousing area than most other mouse bridges, is made of durable hard plastic, and can even be used as an ordinary mouse pad with bars removed. This is a rear mouse bridge designed for optical mice. The Rear Optical Mouse Bridge has rear adjustable legs that raise the bridge for clearance of higher keyboards or where keyboard cables are located at the rear. This bridge features adjustable legs to accommodate the tilt angle of various keyboards. This mouse bridge is perfect for providing a mousing surface above the numeric keypad for keyboards with a non-traditional angle or tilt. It can be used with pull-out drawers (must have a minimum of 1.5" of available space to the right of the keyboard for this side mouse bridge). This bridge features adjustable legs on the side to accommodate the tilt angle of various keyboards and is adjustable for left hand use. The Flat Optical Mouse Bridge is ideal for the Natural Microsoft Keyboard or other non-rectangular shaped keyboards. This bridge has four feet which rest on the keyboard surface, which means the mousing surface is much smaller. 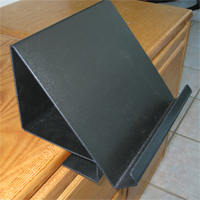 It can be used with pull-out drawers or platforms, with limited usable space or applications where no space is available for other Mouse Bridge designs. The Standard Mouse Bridge Mini from Source One is one way to bring your mouse closer to you by placing it over your numeric keypad. This freestanding document/book holder from Source One is an economical non-adjustable solution for holding reference material. There is a small lip on the 1.5" deep ledge to keep papers from falling off and it will keep thinner books open at the desired page. The easel is 8.75" Wide x 9.0" High. If you are running out of desktop space and need a document holder, then the Slide-On Desktop Document Holder from Source One may be for you. It slips on the edge of your desk between your keyboard and monitor so that you do not have to look to the left or right to view your documents, thus reducing neck strain and/or injury. It is compatible with adjustable arms and platforms too, and is easy to install right out of the box. The Amazonman Universal Reading Rack from Source One is a compact size exercise machine book holder; it can be used on most exercise machines that have a console/display! You can use it on treadmills, ellipticals, steppers, stair machines, rowing machines, bikes or anything that has a console/display for it to hang on. You can put almost anything on the holder: magazines, paperback books, hardback books, binders, text books, etc.